An iPad tutorial that shows you how to port an iPhone application to the iPad. What it will look like when we're done! I recently ported several of my apps from the iPhone to the iPad, and thought it would be useful to share some of what I learned along the way. In this iPad tutorial, I’ll show you how to port an iPhone application to the iPad. 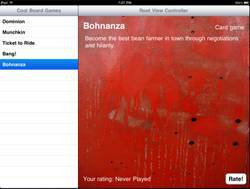 We’ll take a simple app I wrote that displays a list of board games and lets you rate them, and we will port it to the iPad. Along the way, we will cover how to test the device you’re running on, how to handle autosizing and orientation, how to make different versions of a XIBs for the iPad, how and when to use the new iPad elements, and more! You may find it helpful to go through the iPad tutorials on How to use UISplitView and How to use UIPopoverController before you start, but it is not required. The app we’ll be porting is a simple app called “PortMe” that contains some of the elements found in many iPhone apps – table views, standard view controllers, and editing capability. So grab a copy of the iPhone app we’ll port and check it out! You’ll see that there are three view controllers. 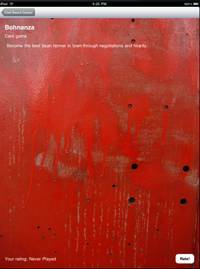 The first is a table view of the list of board games. 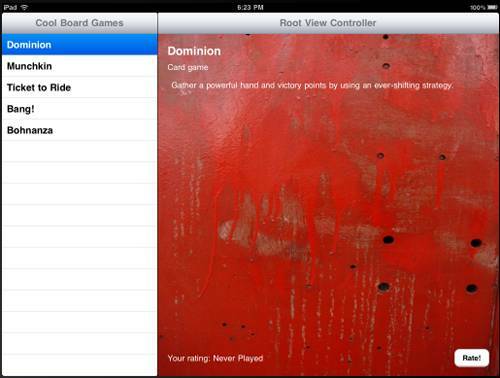 The second is a view controller with a XIB to show the details for a board game. 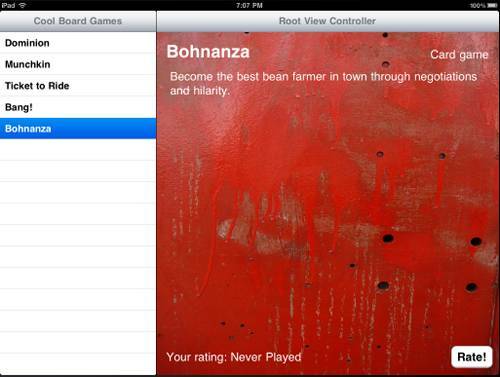 The third is a table view that lets the user rate a board game. Look over the app and make sure you’re familiar with the structure. Once you’re done – let’s get to porting! The initial step to port an iPhone to the iPad is almost misleadingly easy. 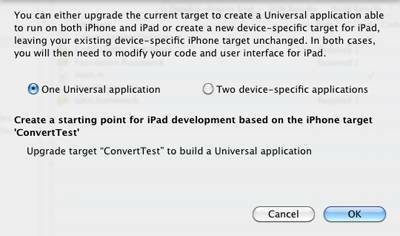 Simply expand Targets and select “PortMe”, then click “Project\Upgrade Current Target for iPad”. In our case we’re going to make a Universal application, so click that and click OK.
Let’s take a look at what this did for us. The first thing it did was to create a new file called “MainWindow-iPad.xib” inside the “Resources-iPad” folder. If you open it up and double click the Window, you’ll notice a big iPad sized Window. The XIB also contains the objects that were in the old XIB – the navigation controller with the PortMeGameListController set as the root view controller. Well, let’s see what it looks like! Make sure “Simulator – 3.2” is selected, and run the sucker. You’ll see the first screen doesn’t look too bad because the table view auto-resizes to the screen, but our second view controller doesn’t fare nearly so well. So we learned our first lesson of iPad porting – it’s not as simple as selecting the “Upgrade Current Target for iPad” option! Now we get to the fun and interesting part – reworking our app to work with the larger screen size and new requirements/opportunities. Let’s start by fixing that messed up view! When I set up the sample project, I just dragged over several UI elements into the view, and paid no attention whatsoever to the autosizing attributes – as could be a common case when an iPhone app is made without rotation support. 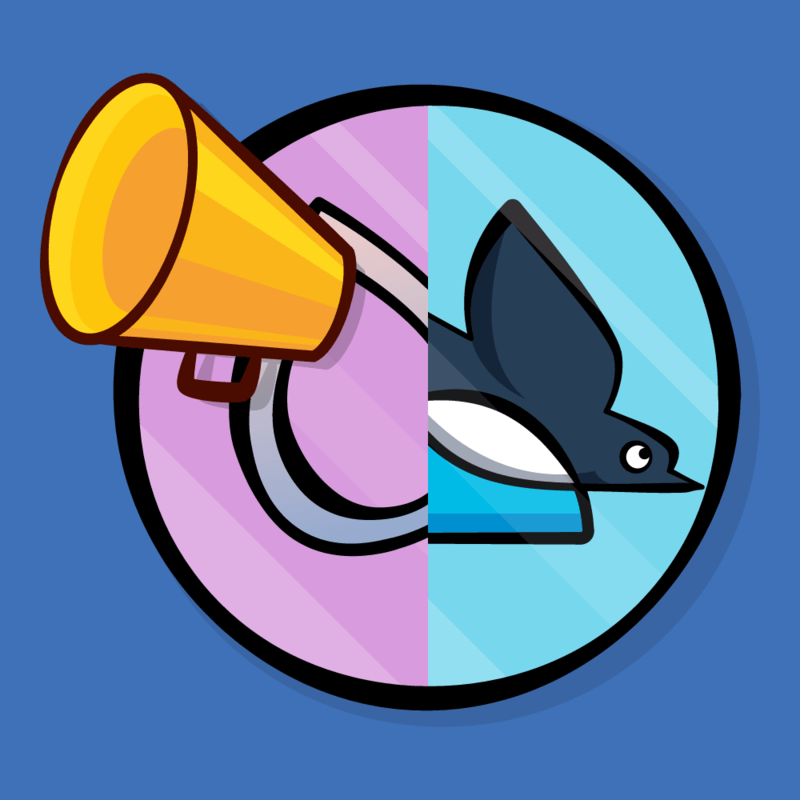 But now that we want our app to support both the small and big screen as well as (eventually) be able to support rotation, autosizing becomes very important. With autosizing, we can tell each UI element how it should react when the size of its parent view changes. The easiest way to see this working is by trying it out ourselves! Open up PortMeGameDetailsController.xib, and double click the view. The animation to the right shows you the behavior based on your selection; in this case, it means that the labels should grow in width as the view expands, and they should maintain their current distance from the top, left, and right. This means that the UIImageView should grow in both width AND height as the view expands, and stay anchored to the edges of the view. However there’s one major problem: if you try to rotate the simulator with “Hardware\Rotate Left” – the iPad rotates but the app doesn’t! And since supporting all orientations is a requirement for iPad apps, that would mean instant rejection at this point. Luckily, since we’ve set our autosizing attributes correctly for our view (and since UITableViewController already supports rotation), we can fix with just a couple lines of code. So far so good! However, our major problem at this point is we’re still thinking in an iPhone mindset. On the iPad, there is so much screen real estate, that we want to make the most use of it rather than forcing users to drill down to multiple levels unnecessarily. And this is exactly what the UISplitViewController and UIPopoverController are for! So let’s see how we can use these in our app – while reusing our existing view controllers along the way. UISplitViewControllers are designed so that you navigate to an item on the left hand side, and then see the details of the item on the right hand side. This would be perfect for our app! We can put the list of board games on the left, and put the board game details on the right. So let’s go ahead and integrate a UISplitViewController into our project. Open up MainWindow-iPad.xib, and drag a Split View Controller into the window, and delete the old Navigation Controller. Expand the Split View Controller tree until you find the Table View Controller. In the Inspector, go to the fourth tab and set the Class to PortMeGameListController. Now we have to set up the right hand side. Let’s think about this a minute. When the user taps “Rate This”, we currently push another view controller onto the stack. This means that we need the right side view controller also to be a UINavigationController (at least for now until we change that). Ok now we need to hook this up to the code. Currently, the Application Delegate is set up to add the navController property as a subview to the main window. However, for the iPad, we want it to add the split view controller to the window instead. This means that we need an outlet for the split view controller. We might be tempted to just declare it as normal – however keep in mind this app needs to work on both the iPhone (running iPhone OS 3.0-3.1.3) and the iPad (running iPhone OS 3.2). iPhone OS 3.2 is iPad only btw. So this means that the older OS versions will not have the UISplitViewController class, and trying to declare variables of that type will cause problems. Therefore, we need to be much more careful about how we use those clasess, and use runtime checks for new symbols. Here we declare the SplitViewController as a generic id so we can load up the class at runtime and avoid problems on the 3.0 OS. The first line is the test you can use to see if your code is running on the iPad or not. 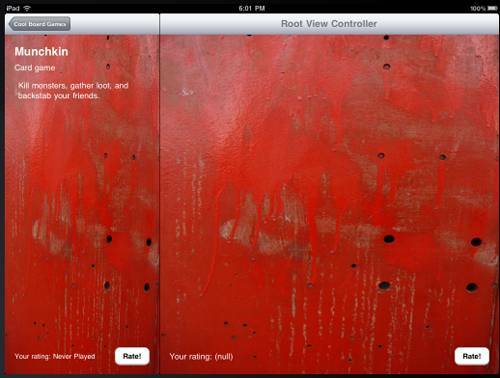 If it is running on the iPad, we want to add the split view controller’s view as a subview of our window. Since we have stored the split view as a generic object (rather than as the UISplitViewController class), we need to get the view by sending a message to it (rather than using dot notation). That’s it for code! Last thing is to go back to MainWindow-iPad.xib and Control-drag from “Port Me App Delegate” to the “Split View Controller” and connect it to the “splitViewController” outlet, and Control-drag from “Port Me App Delegate” to the “Port Me Game List Controller” and connect it to the “gameListController” outlet. So let’s fix that next! As mentioned in the UISplitView iPad tutorial, there are many good ways to hook the left and the right sides of a split view together, but one approach that works particularly well is delegation. So we’ll follow the same approach we did in that iPad tutorial and set up a protocol for “game selected” that the detail view will implemenet to refresh the view. Actually, this is a good point where you can practice doing this on your own and make sure you remember how to do it. If you successfully implement it on your own, just skip to the next section. Otherwise, you can keep following along! If you choose to continue following along, go to File\New, choose Objective-C class, make sure “Subclass of” is “NSObject”, and click “Next”. Name the file “GameSelectionDelegate” and click “Finish”. Then delete GameSelectionDelegate.m, since we don’t need it for a protocol. And for the final step, we can actually connect the delegate using Interface Builder since we marked the delegate as an IBOutlet. Open up MainWindow-iPad.xib and Control-drag from “Port Me Game List Controller” to “Port Me Game Details Controller” and connect it to the delegate outlet. Just like we did in the UISplitView iPad tutorial, it’s standard practice to have a way to bring up the left hand side when you’re in portrait mode by tapping a button in the toolbar. Although what we are about to do is similar to the way we did in the last iPad tutorial, there are a few changes due to this being a Universal app, and since the right side is a navigation controller rather than a view with a toolbar, so you may want to keep following along here. This is similar to the way we did in the past iPad tutorial, except we declare the UIPopoverController as a generic object to avoid problems on the 3.0-3.1.3 OS. Note we have to be careful to only run this if we’re on the iPad (and use message passing rather than dot notation) since we may be running on the 3.0 OS. 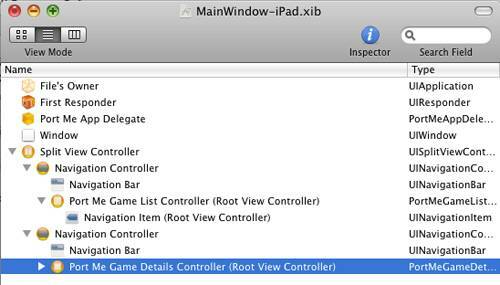 One last thing – go back to MainWindow-iPad.xib and control-drag from “Split View Controller” to “Port Me Game Deetails Controller” to set the right view controller as the delegate of the split view controller. Compile and run the app, and if all goes well you should have an item on your nav controller bar that you can tap to bring up the list of board games! There’s still another area in our app where we’re thinking too much in iPhone terms – the rate button. Rather than going to a completely separate screen, this would be much better served by using a UIPopoverController on the iPad. 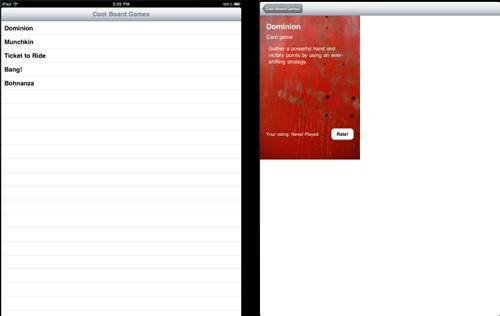 This is similar to the method we used in the UIPopoverController iPad tutorial but again with some slight differences. Again note the use of the generic objects here since this is a Universal app. Here we again switch based on whether we’re running on the iPad or not, and either present a popover or push onto the navigation controller as usual. However note we have to create the popover controller by looking up the class name from a string, and then constructing it. This is again a case where we can’t use the actual class name since we may be running on a 3.0 device. We also use a slightly different method to present the popover here, which lets us specify a rectangle which the popover will point to with an arrow. So far, our port is coming along quite well, and is behaving much more iPad like. However, our detail view could still use some work. 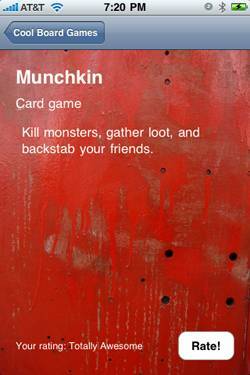 First, the image in the background was actually made for the iPhone, and is just being scaled to the larger screen. So it looks a bit grainy at the larger resolution. Secondly, we could make better use of the increased screen real estate by making some of the text bigger, or moving around some of the labels to make better use of the space. When you start to get a lot of changes you’d like to make to the view like this, you COULD do everything programatically by modifying the UI elements in code and switching on the UI_USER_INTERFACE_IDIOM(), but it’s often easier to just make a custom view XIB for the iPad. So let’s give that a shot! Open up PortMeGameDetailsController.xib, and click “File\Create iPad Version Using Autosizing Masks”. It will create an Untitled XIB – save the XIB in the project folder and name it “PortMeGameDetailsController-iPad.xib”. 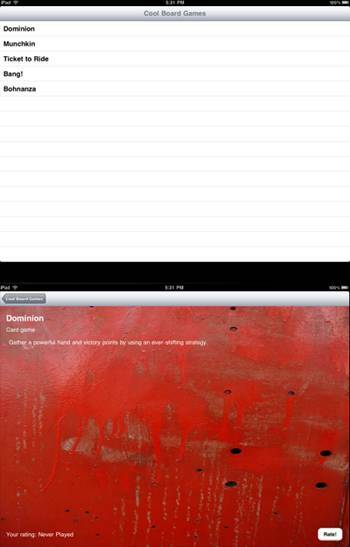 Then download a copy of a higher resolution background image and set the UIImageView’s image to “bg-iPad.jpg”. (Image credit: szajmon). Then, have some fun improving the interface a bit. I’d recommend the moving the board game type to the right of board game name, aligned right. Make sure to fix the autosizing masks appropriately! Also, you should probably improve the font size of everything. Save the XIB. The last step is to make sure that the iPad XIB is the one that is loaded. 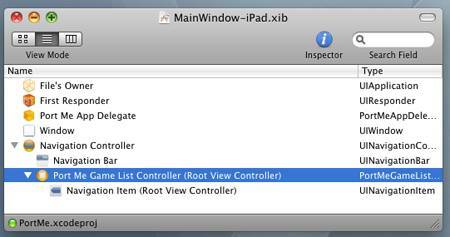 Open up MainWindow-iPad.xib, select the “Port Me Game Details Controller”, and go to the first tab of the Inspector. Set the NIB name to “PortMeGameDetailsController-iPad.xib”. Ok, our app is looking pretty good on the iPad. The next step is to try it again on the iPhone and make sure we didn’t break anything! Erm, but we have a small problem. By default the simulator launches directly into the iPad simulator (not the iPhone simulator). So what do we do? The workaround I used was to just test on the device. However if that is annoying, Noel from Games from Within has written a nice post about Universal Apps that includes a workaround to run in the iPhone simulator. That’s OK. We can fix this by a setting in our Target Info. 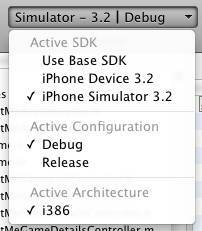 Basicaly, even though we’re compiling against the 3.2 SDK, we can deploy to a different SDK. This is why we were being so careful about using all of those runtime checks – we have the 3.2 headers available to us but maybe not the actual code when we run on the device. Add default images for the iPad. You’ll need the Default.jpg like you normally would (this will be used on the iPhone). But now you’ll also need Default-Landscape.jpg and Default-Portrait.jpg for the iPhone screen size. The sizes of these images needs to be 1024×748 (landscape) and 768×1004 (portrait) – basically the size of the screen minus the status bar. Add a 72×72 icon into the project to be used on the iPad, and create a new key CFBundleIconFiles to your info.plist, and put the names of both icons inside as an array. The OS will pick the appropriate icon based on size. 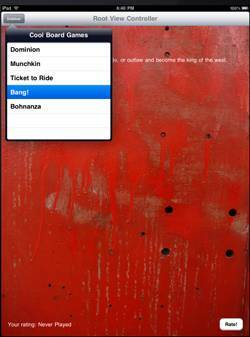 The easy fix is just to dismiss any current popover controllers when you display another. But there’s a tricky case where you need to launch a popover controller from the left side of a split view – since the left side could itself be a popover in portrait mode! By this time you should have a firm grasp on the major tasks you’ll come across while porting an iPhone app to the iPad. From here I’d recommend reading through Apple’s iPad Programming Guide, if you haven’t already. It discusses a lot of what we just covered above, as well as much more useful information! Here is the sample project with the completed iPad port! 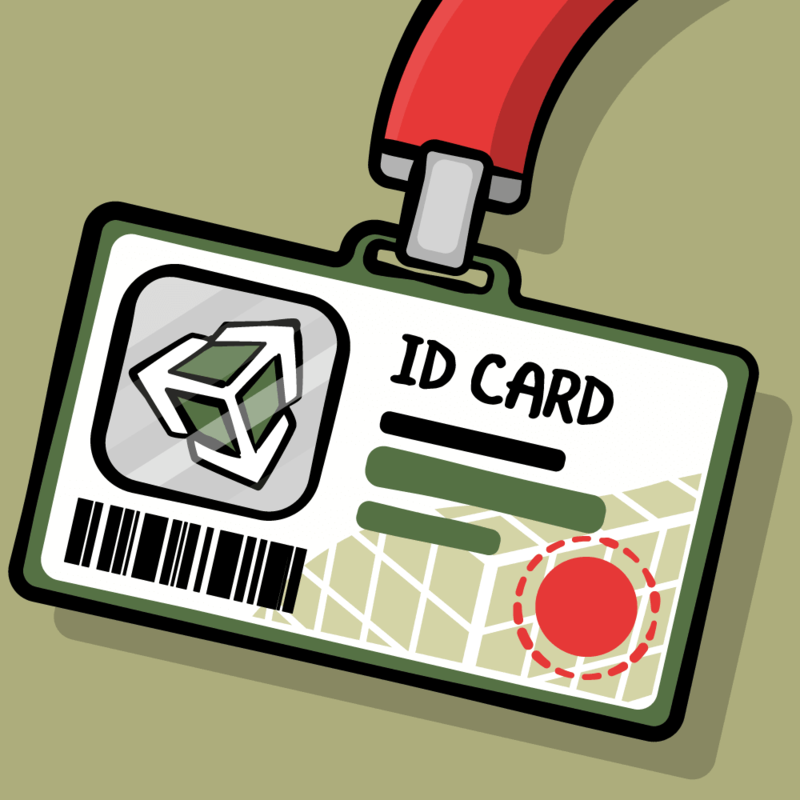 I’d be curious to hear about your experiences porting iPhone apps as well!